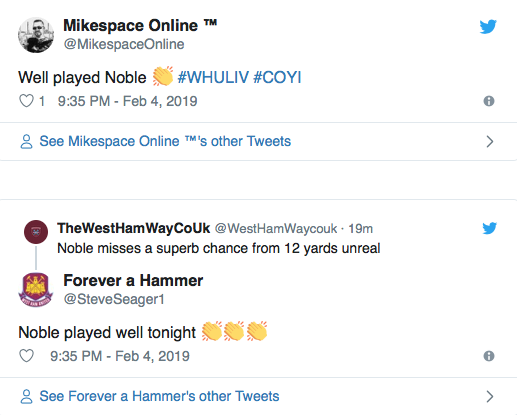 Mark Noble produced a captain’s performance for West Ham United as they battled their way to a deserved 1-1 draw with a flat Liverpool side on Monday night. The midfielder was involved throughout, providing a combative presence in the middle of the park right up until his puzzling second half substitution. It’s become clear over the course of this season that the Hammers simply function much better when the Englishman plays than when he doesn’t. 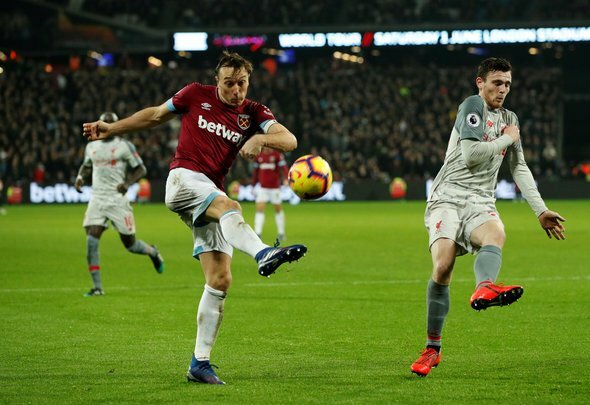 That was demonstrated once again at the London Stadium as Noble took the game to Naby Keita, Adam Lallana and co. He’s not a spectacular player, everyone who’s watched him knows that, but he works hard and he’s surprisingly good on the ball. The wonderful cross field pass that he executed just prior to his substitution was magnificent. Yes, he missed a chance or two, but overall it was a fine day at the office for the veteran. Noble was superb tonight imo. Couple of quality passes and some big tackles gone in. Obiang needs a big 15 mins as our midfield opened up when he came on last weekend. Obiang for Noble, who played well tonight. Carroll for the invisible Hernandez. Noble beating that ponytail bum Van Dijk in the air, my captain.